Daniel Alexander is still recovering from his scary crash at Stadium Finance Rally South Canterbury but he can see the light at the end of the tunnel. 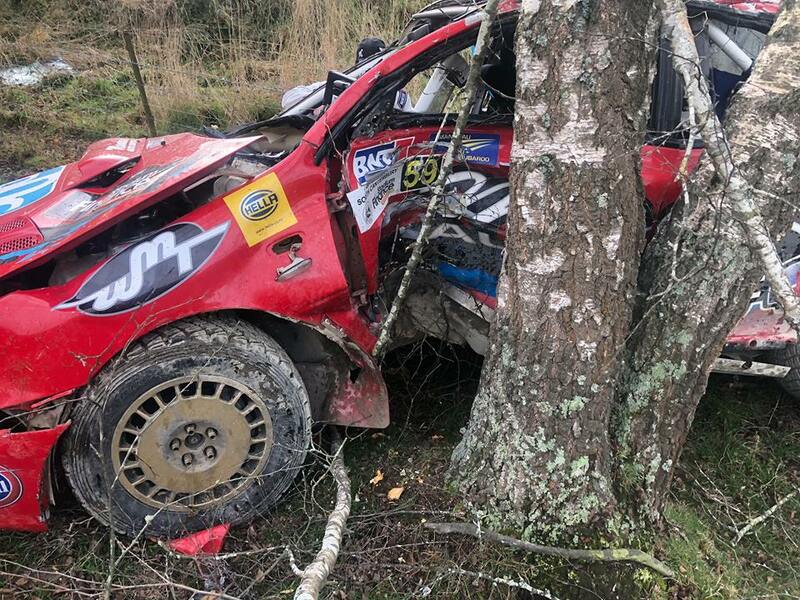 Alexander and co-driver Chris Gracie went off the road and barrel-rolled at 160km per hour into a tree, destroying their Subaru Impreza before being taken to Timaru Hospital. Gracie was basically unhurt in the incident barring a slight concussion but Alexander’s injuries were a little more serious. “Basically I have a broken left collarbone and some internal bruising and some internal damage,” he told NZRC. “I am slowly repairing. I had a couple of weeks off work and now basically just doing a few short hours here and there. I am coming right. Life still goes on. I am a lot more mobile than I was a couple of weeks ago. Photos of the accident show vividly how lucky the pair was to escape major injury. “We were lucky in a very well built car,” Alexander said. “We had all the best safety gear that is available on the market and all of those things aided in a very, very horrific crash. “Basically I was heading around a six left, next thing the right rear clipped the bank, pushes the nose around and we launched off the side of the road into a massive barrel-roll. 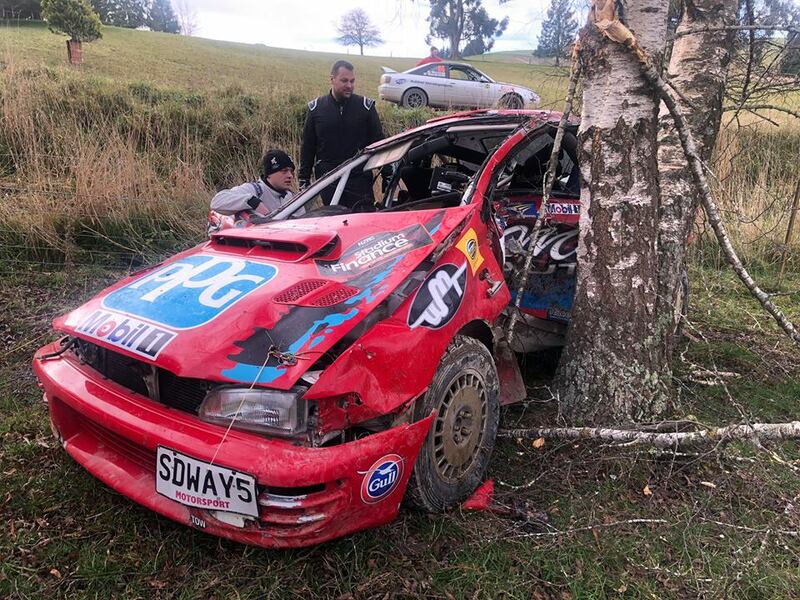 “Apparently they said I was going 160km and the impact with the tree was 19 Gs, which is on NZ RallySafe and is one of the biggest recorded. “We rolled seven or eight times and then hit the tree about 2 metres up and stopped suddenly. The impact with the tree caused major damage on Gracie’s side of the car yet the safety gear did its job and protected him. “Chris lost about 60 percent of his foot well as the cage collapsed around and under his legs and luckily it didn’t touch him at all,” Alexander explained. Alexander is already thinking about his return to driving and is adamant the accident won’t have a lasting impact on him. “I want to get straight back out there. I want to do Coromandel but my wife said no. I want to do it to get back on the horse again so it doesn’t affect me. “The scariest thing in my head was not about me getting injured was that I am glad Chris wasn’t injured. “That would be the worst thing if something happened where I ended up disabling him or ruining his life. We both know the risks but it isn’t until you have a big off like that when it becomes real. “I haven’t discussed with Chris whether he is keen or not.